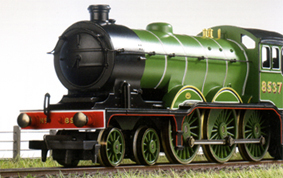 Information: The B12 class was designed by the Great Eastern Railway to replace older 4-4-0 Claud Hamilton designs on express passenger workings. The design was to become the last inside cylinder 4-6-0 to remain in service on British Railways. Details: By 1911 the need for heavier express passenger workings necessitated replacing earlier 4-4-0 Claud Hamilton designs with a modern lighter axle load 4-6-0 design able to be turned on the short turntables predominant in the North East sector. Originally designated Class S69, and later reclassified B12 by the LNER the original build design consisted of 71 locomotives being fabricated at the GER Stratford Works. Due to the short wheel base and light axle load the class became popular on medium length express passenger workings out of London Liverpool Street Station to the Norfolk, located on the North East Coast. In 1926, 20 were rebuilt with changes to the cylinder design and designated B12/2. A final batch of 10 B12/3 locomotives were constructed at Beyer Peacock Works in 1928 for the successors of the GER; the LNER. A final B12/4 design involved more rebuilds of the original locomotives with smaller boilers for use on lightly loaded branchlines when they were transferred to Scotland. Visual differences between earlier builds and the final designs included the provision of smaller domes, less ornate running plate valances, and the addition of external feed water pumps and heater systems. Although fairly successful, the class soon became outdated by modern designs using three cylinders; such as replacement B17’s introduced by Sir Nigel Gresley in 1928. This resulted in the B12’s being reduced to secondary lines or withdrawn from service completely. Withdrawals commenced in 1913 with one member due to accident damage. Remaining class members were withdrawn between 1945 and 1961. One member of the original B12/3 class, BR no. 61572 survived into preservation.